An increasing number of airport and airline operators are deploying effective security systems and solutions to protect their IT systems and infrastructure from cyber-attacks. These solution help in protecting the critical infrastructures and reducing the severity of cyber-threats, which can otherwise cause heavy financial losses and disruptions in the worldwide transportation network. The demand for better aviation cyber security solutions such as unified threat management, identity and access management, risk and compliance management, and vulnerability management for the aviation sector are expected to significantly drive the global aviation cyber security market over the forecast period. Transparency Market Research states that the revenue valuation of the global aviation cyber security market stood at US$2,545.2 mn in 2016. The market is projected to expand at a CAGR of 7.4% from 2017 to 2025 and reach US$4,759.3 mn by 2025. In terms of services, the global market for aviation cyber security is segmented in the report into managed security solution, training, and consulting. Of these, the segment of managed security solutions presently accounts for a massive chunk of revenue in the global market and is expected to hold over 73% of the global market by the end of the report’s forecast period. The segment will significantly benefit from the increasing adoption of outsourced monitoring and management solutions in the aviation industries across regions such as North America, Europe, and Asia Pacific. The segment is expected to expand at a promising 7.4% CAGR from 2017 to 2025. However, the segment of training services is expected to lead in terms of growth rate over the forecast period. The demand for training services in the global aviation cyber security market is expected to exhibit a 7.9% CAGR from 2017 to 2025. 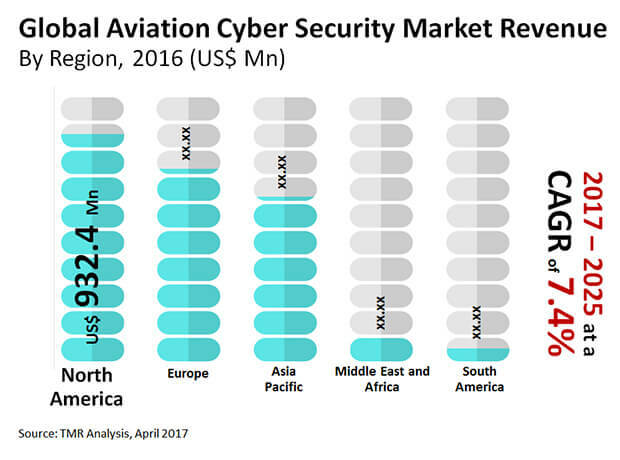 From a geographical perspective, the North America market for aviation cyber security dominated the global market in terms of revenue contribution in 2016. The region accounted for over 36% of the market in the said year. The leading position of North America in the global aviation cyber security market is chiefly attributed to the presence of large airline operators and airports. Same applies to Europe, which is another leading contributor of revenue to the global aviation cyber security market. However, the growing number of medium and small airline operators in other regions is expected to impact the market share of North America and Europe in the coming years. Asia Pacific is anticipated to contribute significant chunk of revenue to the global market over the report’s forecast period owing to the thriving aviation industry. Due to the severity of rising cyber-threats and introduction of new airline services, Middle East & Africa (MEA) is expected to emerge as one of the key regional markets for aviation cyber security solutions in the coming years. Furthermore, South America is expected to register the highest CAGR growth over the forecast period owing to the introduction of many new low cost carrier airline services. Some of the leading players operating in the global aviation cyber security market are Airbus Defence and Space SA, BAE Systems, Inc., Computer Sciences Corporation, General Electric Company, General Dynamics Corporation, Harris Corporation, BluVector Inc., Palo Alto Networks, Inc., root9B Holdings Inc., Rockwell Collins, Inc., Raytheon Company, Thales S.A. and Unisys Corporation. Aviation cyber security solutions typically entail software programs meant to defend computers, aviation networks, and databases from crippling cyber-attacks and unauthorized access. With a flourishing aviation sector that is being rapidly digitized with IT solutions and other technologies – meant to improve services in a cutthroat environment – cyber security has become a pressing problem. Over the years, attackers have come up with more sophisticated ways to attack systems and temporarily ground the functioning of aviation companies. This has warranted aviation cyber security solutions. Currently, the global market for aviation cyber security is choc-o-bloc with players making the competitive landscape fragmented in nature. However, despite it, the five leading companies in the market accounted for a considerable 59.0% share in it in 2016. Due to the presence of numerous players, competition is currently red hot in the market for aviation cyber security. To thrive in such an environment, savvy players have been going the inorganic route of mergers and acquisitions which helps them to access diversified aviation cyber security products, penetrate hitherto untapped markets, and also gain access to other valuable resources. Majorly fuelling the market for aviation cyber security is the growing aviation industry, increasingly dependent on latest technologies such as cloud storage and computing and data analytics for its seamless functioning. The growing spends by aviation companies on enhancement of their IT infrastructure, and enormous adoption of commercial aviation services, particularly in developing economies of Asia Pacific and South America, have also warranted proper bulwarking of systems housing crucial data and programs from any form of external threats. Such threats can cause major financial losses and disrupt operations. This has pushed up demand for aviation cyber security solutions. Another factor leading to an upswing in demand for aviation cyber security solutions is the highly complicated nature of the attacks which makes it necessary to prevent them from happening in the first place. Posing a challenge to the market for aviation cyber security, on the other hand, is the steep initial upfront investment required for installing superior aviation cyber security solutions. This has created entry barriers for smaller market aspirants. Stiff competition and tremendous customer loyalty enjoyed by well-entrenched players are also making it tough for aspiring players to make much headway in the market. The managed security services are predicted to spell maximum opportunities in the near future. It is expected to contribute a whopping 73.0% of the revenue in the global market for aviation cyber security. North America is one of the key regions in the global market for aviation cyber security. The region is mostly powered by the U.S., where most of the prominent names operating in the market are domiciled. In 2016, North America held a substantial 36.6% in the global market for aviation cyber security. In the years ahead too, the region is predicted to be the main contributor. The overall growth in the North America market, however, will slow down on account of it having reached a saturation point with players running out of new avenues to push growth through. South America is predicted to offer maximum opportunities in the global aviation cyber security market. The market in the region is expected to rise at a healthy pace in the next couple of years. In order to assess the competition prevailing in the global market for aviation cyber security, the report studies companies such as Raytheon Company, BAE Systems Inc., General Dynamics Corp., Thales SA, and Harris Corp.